Book Review – The Savvy Entrepreneur’s Toolbox. At Concept, we like to review materials that assist entrepreneurs and marketers in building their business. Whilst we know that TV Advertising is the most powerful advertising medium, it is absolutely essential to run with a mix of communication strategies. Discover more about internet marketing tools. The Savvy Entrepreneur’s Toolbox is more than just ‘another’ marketing book. Having read the book ourselves, we find that it takes a down-to-earth approach to modern marketing techniques from the perspective of a small business entrepreneur. The book is well written and combines technical knowledge with good business sense. There is a strong focus towards the development of a progressive marketing strategy based on results using performance measurements throughout – something we preach on a regular basis with our TV Advertising plans. Business planning, marketing plans and overall entrepreneur strategy with a focus on internet based marketing tools. It will show you how to create marketing strategy using on-line tools such as Google Adwords, Facebook and Twitter, as well as some of the other web based networks and tools. There’s also a handy resource index at the end of the book, linking to useful tools and materials. It’s a good read and well worth a few hours of your time. Does it live up to its claim as being “a no-nonsense approach to ensuring customers find you, love you, frequent you, and share you with others, no matter your field, location, or monetary goals.”? We think it does. And currently available at £1.93 – it’s a no-brainer buy! 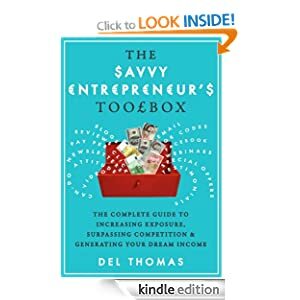 Kindle Book – The Savvy Entrepreneur’s Toolbox by Del Thomas, Edited by Stacey Aaronson and available on Amazon.